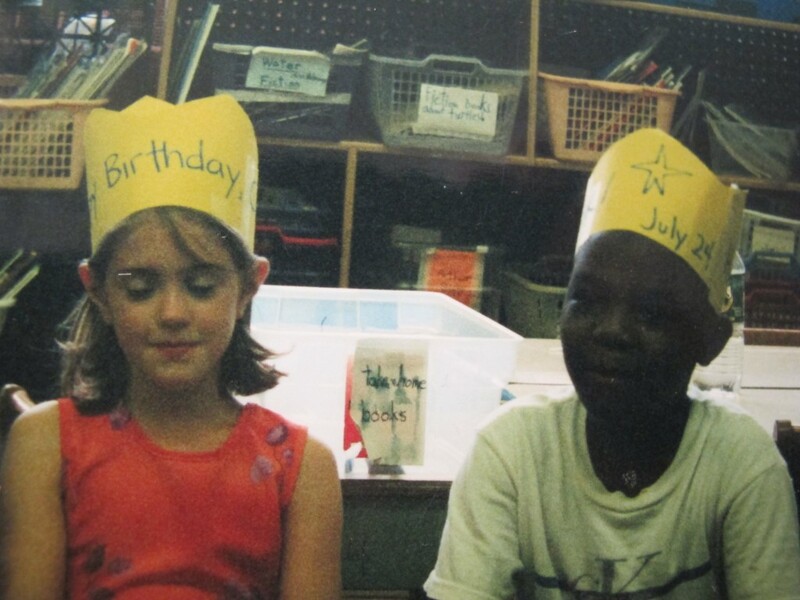 Chloe and Malick celebrating their summer birthdays. There is your chair, and the birthday child’s chair. and makes her choice certainly and without hesitation. So no wonder a book is at the center of this ritual. a ponytail to manage!–engaging the class all the while. gives way to Just in Time for the King’s Birthday. each time you say it. to be eaten once a year. as ecstatic as if they were singing Bach! The End. The children are satisfied. you found at Gerritsen Creek. The child knows just what to do. This is the end of the second year, after all! stars and planets revolving around this glittering birthday crown. Goes into moments of a little reverie. A reverie? A meditation on entering this world? then, how old are you? Arms rolling, a roll for good luck. Napkins! Cupcakes! Ah, now we are back to the real world, a group of hungry seven year olds. we would still hear you. This beautiful poem, written by Sophie’s mother Barbara Danish,was a gift for me at the end of my second year teaching a class of lovely children. We began our birthday ritual in September of kindergarten and ended it in June of first grade. The poem really says it all. Our ritual was simple. When the children came in I had a pre-cut but undecorated paper crown waiting on a table and children who wanted to began to “pretty it up” – crayons, markers, glitter – whatever they chose. The morning message contained the first official birthday wish of the school day. At the end of the day we had our birthday circle. A chair was set up for the birthday celebrant. I had a basket of books with birthday themes for the birthday child to choose from. Some popular books were Just In Time for the King’s Birthday; Happy Birthday Little Bear; A Birthday for Frances; Happy Birthday, Moon; The Secret Birthday Message; Some Birthday! ; Birthday Soup (a chapter in the Little Bear book), and A Letter to Amy. The birthday child picked a book for me to read to the class. The children giggled and loved when I substituted the name of the birthday child when I read the story! I had a smooth stone that was our birthday stone. After the story, the stone was passed from child to child, moving around the circle. When a child held the stone, he/she shared a birthday wish. Some children merely said, “Happy Birthday.” Others shared a personal wish or a memory connected to the birthday child. It was so interesting to observe how the quality (and length!) of each child’s birthday wish changed as the year progressed. Since I had the children for two years, there was so much growth that I could see just by listening to the depth of these shared stories and wishes. Next came the waited for moment. The birthday child made a silent wish and blew out a candle that was placed in the middle of the birthday cupcake. Cupcakes were usually brought to school in the morning by the child’s parents. On some occasions, I rushed out to buy cupcakes and juice at lunchtime if a child didn’t bring these to school. Parents were told at the start of the school year that they could only bring juice, cupcakes or muffins and, if they liked, some birthday plates and napkins. I did not allow cakes or party bags. Also, if children had parties outside of school that did not involve the entire class, then invitations had to be mailed, not given out in class. After the candle was blown out, we sang the Happy Birthday song and then children went to the tables to eat, drink and chat. This was our ritual. The pattern was the same for each child. The children loved it. I loved it. Nobody had, what my mother-in-law would have called, a hooh-hah extravaganza and I really don’t think that anyone felt deprived. Our birthday ritual was part of the glue of our classroom community, overflowing with love,warm wishes and sometimes the tears of visiting parents! This entry was posted in Investigating Choice Time: Inquiry, Exploration, and Play and tagged happy birthday, ritual on August 29, 2013 by Renee. This is a lovely ritual. My favorite parts are the books and the passing of the stone. It doesn’t take very long I assume. Do you do it the day of the birthday or celebrate all September birthdays on one day? I think some teachers did that. I honestly don’t remember. I do remember taking cupcakes to my daughter’s classrooms so everyone could celebrate. I often had to let her take them because I was teaching as well. But I think it’s lovely to share with classmates. Thank you. I did the celebration on the day of the birthday. We did it at the end of the day. It took about 30 minutes although at the end of the year the children had so much to say, so it might have taken a bit longer. I did have a celebration for summer birthdays at the end of the school year. Some years I had all summer birthdays together and some I did it on different days for each summer birthday child. I guess it depended on how many summer birthdays there were, how many June birthdays, etc. Obviously the photo I included in this posting was for a summer birthday celebration for two children. I think that they were in first grade (I looped with my kindergarten class) and my time was often more “pressed” in first grade. I love the basket of books idea!!! Thank you Cecille. There’s probably so many more wonderful birthday books than I listed in the post. Lovely ritual Renee! I love how each child offers a message to the birthday child! I bet it’s fascinating to hear how the children’s comments develop over the course of the school year! I’m going to borrow this ritual if you don’t mind. Hopefully I’ve got a group of PreK students who can be active listeners for that long. My students last year could absolutely have participated in this ritual. Crossing my fingers! Thanks for sharing your thoughtful teaching experiences!